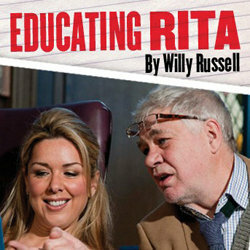 Willy Russell’s Educating Rita began as a stage comedy in the early 1980’s but it is the film starring Michael Caine as Open University English Literature tutor Frank and Julie Walters as Rita, his mature student, that is best remembered. My recollection of the film was that the character of Rita was the more interesting of the two personalities. Although Michael Caine was the star name in the film, it was the performance of the then little-known Julie Walters that gave the film the success it achieved. Thus, Claire Sweeney’s performance as the Liverpudlian hairdresser from a working class background in her early 30’s seeking intellectual improvement is crucial. This she does splendidly. She brings out the feistiness in Rita’s character and her determined optimism. The Matthew Kelly role is more of a stereotype. He is played as an aging, long white haired cynic who, in his younger days, had aspirations of becoming an acclaimed poet. Without any recognition, he has turned to alcohol and had to settle for the drudgery of getting students through exams. Both performers work well together to bring out and sustain the humour in the script. The play succeeds in depicting the transformation of Rita achieving what she wants for herself and Frank’s decline as really the weaker personality despite all his learning and knowledge.